Following on from the first edition of the Pali Mince Pie Competition, more mince pies have been tested and scores are coming in thick and fast! As you may have read on Pali’s first mince pie blog, there was a bit of drama when the Asda baked in store mince pies were sabotaged by some of the male apprentices. However, this didn’t stop Nick Senior who came to the rescue and bought another tray to be tested by our trusty team of 9 including; Liam, Gill, Julie, Mal and Eve! The hot favourite are from Asda, baked in store with a huge score of 79! If you know a shop that sells mince pies and would like to make a suggestion, please feel free to comment below and Pali will test as many mince pies as our waist lines can handle! 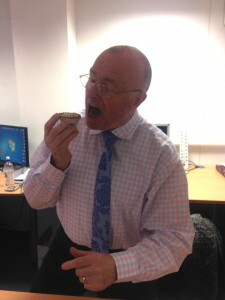 Pali Ltd – always bringing you the best conveyancing searches known to man and still comparing mince pies! All for the love of our clients and readers to ensure your Christmas has no disappointments in the food department!